Founded in 1910 and often described as an inland links, Sandy Lodge Golf Club was designed by Harry Vardon and is one of Hertfordshire’s jewels. “It deserves its name in that it is wonderfully sandy.” Wrote Bernard Darwin in The Golf Courses of the British Isles. “It is a fine training-ground for the driver, and also for the putter, for there are no better greens near London.” More than one hundred years later, Darwin’s comments still hold true. Sandy Lodge was formed by a frustrated London businessman called James Francis Markes who was tired of playing golf on the muddy parks around the capital. Markes soon realised that the land at Sandy Lodge Farm was perfect golfing country and he enlisted his close friend and six-time Open champion, Harry Vardon, to fashion a golf course. The result was a wide-open, windswept, inland course that resembled a seaside links and Sandy Lodge remained that way until the outbreak of the Second World War when it was turned over to grazing. Fortunately, the course was restored after the war, but unfortunately large sandy waste areas were grassed over and tree and shrub growth ensued, changing the look and feel of Sandy Lodge. Despite its changed outer look, the Sandy Lodge golf course remains true to its original roots. It may not be the longest golf course in the area – measuring a little less than 6,500 yards from the back tees – but it’s still a fair and enjoyable challenge for golfers of all levels. With six par threes and five par fives on the scorecard, there is no shortage of variation at Sandy Lodge. The pick of the half-dozen one-shot holes is the long, downhill 15th called Markes’ Pride which is ringed by a quartet of bunkers and numerous trees. Laddie’s Cockpit, the 7th, in contrast to 15, is a bunkerless par three but it’s a very attractive one shotter that requires careful club selection in order to mark par on the scorecard. Sandy Lodge is a not only genuinely sandy, it’s also a very hospitable club and the membership is very fortunate to have such a lovely course to tee it up on every week. Awesome greens in great condition (October 1st), of good speed (I would guess around 10) and with some interesting and difficult slopes. My first visit to Sandy Lodge and course presentation was excellent throughout with tees, green approaches, bunkers and practice areas looking good; fairways have obviously suffered during the dry summer but did not detract at all from the day. A very friendly club as well. An unusual course layout with six par 3's ranging from the short 101 yard 8th (with devillish green) to the 213 yard 15th. Pick of the par 3's was the 10th, appropriately named 'The Table', which was set on a plateau with sleeper bunker front right and steep banks all round; with a firm undulating quick green and playing 186 yards it really was a difficult hole. The 18th, also a par 3, was for me a disappointing finishing hole, but I must confess to a dislike for uphill par 3's where you can't see the bottom of the pin. To counterbalance the par 3's there are five par 5's. I thought the 1st was probably the worst hole on the course as it is rather modern looking with mounding and totally out of character with the rest of the course; if I was guessing I would think it has been re-designed to accommodate the driving range. The other par 5's seemed to have an unusual feature in that the second shot (being a lay-up for me) all seemed to be played semi-blind with no view of the green. The par 4's were the pick of the holes for me. Arguably the 2nd with the carry over the sleepered bunker to the green was the best and would be a great finishing hole. Back to back long par 4's at 5 and 6 were the toughest holes but my personal favourites were 9 and 12, not overly long but requiring accuracy. I thought some of the fairway bunkering was excellent which made it an interesting driving course; on both the par 4's and par 5's it was only when you reached the ball on the fairway that you realised how tight the gap was. 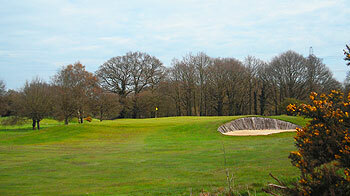 Sandy Lodge is a course with tight, firm fairways and lots of interest throughout its 18 holes. When I played here in March the course was in fabulous condition, it was extremely dry underfoot and the greens were nicely paced and true. There are many unusual features that elevate this course, situated near Watford inside the M25, towards being one of the most enjoyable I have played in this area. The wooden sleepered bunkers found at the second and 10th give the course character and it’s a shame there weren’t more of these throughout the round. Incidentally, and regardless of the bunker-style, these are two of the best holes on the course. The latter in particular is a truly exceptional short hole with a deviously raised green. The course ends with the loveliest par three played across a large depression to a wickedly sloping green flanked by trees and defended by spectacle type bunkers. Sandy Lodge is never going to be recognised as one of the UK’s great courses but it perhaps deserves slightly higher recognition than it appears to get. Had the pleasure of playing at Sandy Lodge recently on a cold but bright winter’s day. The course was slightly wet underfoot and we were playing off the winter tees, but given there was no run, I suspect it played no shorter than it might in the summer (albeit the lack of rough perhaps made things slightly easier). Although playing from winter tees, this actually made things no easier as two par 5’s became long par 4’s (1 & 17), although it did take some (but not all) of the fairway bunkering out of play.The course starts with a series of tough par 4’s (1, 2, 4, 5 and 6) with 2 & 5 being particularly notable. This then leads to a mid-section of good variety. The best holes here in my opinion being the 7th and 10th (both excellent par 3’s and the par 5 11th (a fabulous 3 shotter, into the wind on the day we played). The finish is tough, with 14, 15 & 16 all playing much longer than their yardage suggested on the day we played, whilst still giving excellent variety (particularly the par 3 15th). The 17th (being played as a par 4 as mentioned) is a real brute, and the course closes out with an attractive uphill par 3 flanked by mature trees.There’s a lovely open feel to most of the land, and it’s a relatively easy walking course, making for a relatively speedy round. Sandy Lodge has a traditional clubhouse near the 1st tee / 18th green as well as a driving range, short game area and a great putting green also close by. It was in great shape for this time of year, and considerably drier than many others in North London given the recent rain. Overall a lovely experience, and excellent value at this time of year. I look forward to coming back and seeing it in the summer. Played here on a bright November day - the course was in excellent condition, dry underfoot despite the incessants rains of the previous few weeks. A proper test of golf - some excellent par 4s, strong par 3s and quick, tricky greens. I would rate this higher up the pecking order in Hertfordshire - its a gem. First thing to mention here is that if I lived locally and was looking to join a club, Sandy Lodge would be high on the list of possibilities. The main reasons being that the course variety and its challenge are obvious, the extensive warm-up facilities, the club atmosphere and because of the sand-based land the course stays open for several weeks longer than other local courses during the now regular long English winter, with no temporary tees or greens either – sales pitch over! My recent visit was some seven years after my first and I had a very enjoyable time; the course for me is not just one of two halves but one of five different stories …. Let me explain; the first four holes are there for the taking in terms of scoring, we should all play to handicap or better. Two long and tough par-4’s at the 5th and 6th bite back and then we move to my ‘third’ part of the course. This must be pretty rare, three par-3’s in four holes and it is the middle one of these, the ultra-short 8th at only 100 yards known as the ‘Wee One’ that may just catch you out. Obviously nothing too tricky about a 100 yard shot but this green has some fantastic slopes as protection, they do not look that distinct but they will test even the best putter. The next collection of holes; 11-15 are strong with plenty of variation (two par-5’s, two par-4’s and a par-3 at the 15th) – oh, do make a stop at the welcoming halfway-hut before the 12th tee. We move to another great part of the course for the last three holes; a testing drive on the par-4 16th with out-of-bounds on the left and a fairway sloping left to right, which means many shots will be in the right rough or even in one of the two ‘perfectly’ placed bunkers. The 17th is my favourite hole; an uphill right to left sweeping par-5 with a wonderful tree lined left-side to the hole and then a two-tier green. The final hole is another par-3 and this is very strong; around 150 yards and basically all carry over the ravine and named “Jacob’s Gable” after ex club-pro and renowned golf coach John Jacobs, he once lived behind the 18th green and the top of his house was always the ideal line. If Sandy Lodge had a little more acreage it would one of the best courses inside the M25. The only downside to the course is that the holes are a little too crowded together. However, having said that, it’s one of my favourite London courses with big bunkers and excellent greens. It is not on the grand scale of its next-door neighbour, Moor Park, but it has charm and intimacy. The largest bunker on the course is similar to that at the Cape at Royal North Devon, except here at Sandy Lodge it comes into play for the approach rather than the drive. Aptly called Sleepers it represents a fearsome hazard so early in the round. The bunkerless par three 7th is a cracker of a hole that has to be played with finesse when the ground is hard and fast otherwise you’ll be OOB. 15 is another great one-shot hole to a green with a false front that requires a running links-like shot unless you can land the ball by parachute. 17, the signature hole, called Mount Vardon, is a wonderful sweeping par five with a narrow fairway and a tricky-to-hold two-tier green. It’s always a pleasure to play Sandy Lodge and I look forward to playing this quintessential English gem again in the not too distant future.